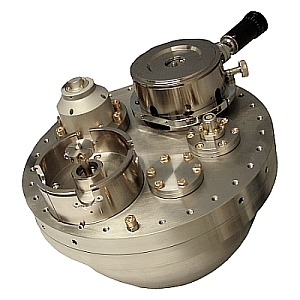 The hemispherical imaging energy analyzer has considerable benefits for both PEEM and LEEM users. PEEM users can perform chemical mapping on the surface with XPEEM or µXPS from surface areas as small as 1.5 µm. The µLEED images obtained from equally small areas are free from inelastic scattered electrons. The Elmitec imaging energy analyzer can be adapted to most microscopes (LEEM III, LEEM V, ACLEEM and PEEM III). 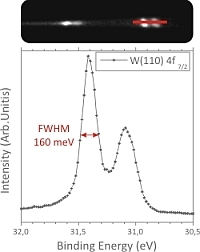 After deconvolution of the FWHM of the W(110) 4f7/2 peak, the experimental Gaussian broadening is found to be 115 meV. Data taken Jan. 2010 at MAX Lab, Lund, Sweden.